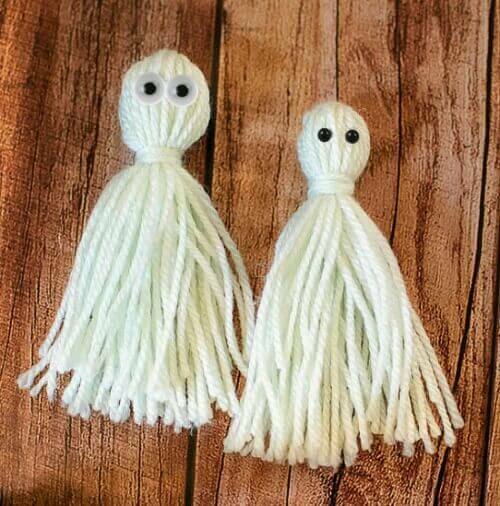 These little ghosts are a super easy yarn craft and also great for crafting with the kids! They work up super quick too and will be ready to hang and haunt your home in no time. Essentially, they are just tassels with some craft eyes. If you don’t have a tassel maker already, you can purchase one here or you can make your own for free with my How to Make Tassels tutorial. To make your tassel, follow the directions on your tassel maker, or follow the directions in my How to Make Tassels tutorial. If making your own, you will need need to cut a piece of cardboard or card stock to the size you want your ghosts to be. I wanted mine to be about 6 in. tall, so I cut my cardboard piece to 6 in. high × 3 in. wide. Once done, snip off any uneven pieces across the bottom. You can leave the top strings as a loop for hanging or tuck them into your ghost if desired. Cut some felt pieces into small circles for eyes or use craft eyes or beads to decorate your ghosts. If your felt or craft eyes aren’t self stick, use a tiny bit of glue to stick them in place.